This post is sponsored by Northwood Realty Services and The Motherhood. All opinions are my own. At the end of 2015 I wasn’t sure that I wanted to continue with Pittsburgh Brown Mamas or BrownMamas.com. I started running Brown Mamas as a full-time job back in 2013. My vision was to create a supportive environment for Black moms in Pittsburgh and run a website that could compliment the organization with guides, keep-it-real articles and words that highlight the beauty in Black motherhood. It was all good at first, then I found myself running to meetings everyday, staying up late to craft articles, using all my spare time planning events and constantly on call to answer the 75+ Facebook notifications (and 5-10 private FB & twitter messages I’d get in one day). My brown mama tank was running on empty. (I mean below E at the point when you start praying that your car doesn’t stop before you get to the gas station, or meet-up in my case.) I stopped having movie night with my kids, our Thursday toe massage while watching Tamar & Vince that I looked forward to with my husband came to a screeching halt and (this is no lie) August came and went and I hadn’t had a pedicure. The light in my eyes and pep in my step that was palpable when I started PBM was now damn near dead. 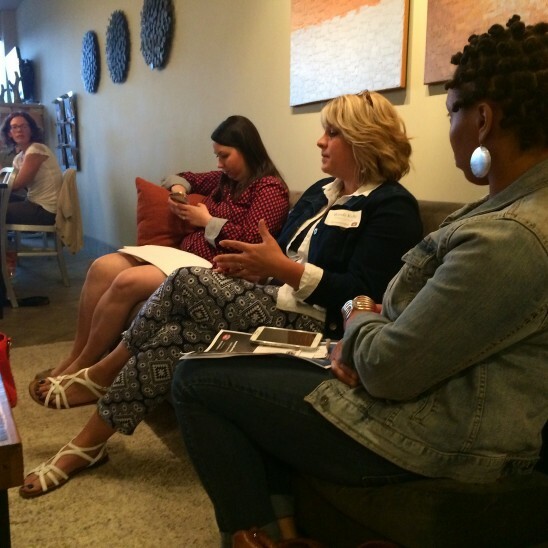 Last fall I attended a meeting with moms who worked for Northwood Realty. I was there as a blogger and I really expected your run-of-the-mill press event where bloggers are invited to see the glamorous side of the business and expected to go home and write a glowing review of how great it is to be a real estate agent and all that jazz. What I found instead was a bunch of moms who admitted they weren’t perfect mothers, but had found a career they really loved and were willing to weather the storm for it. I found myself in a deep, almost philosophical, conversation with Northwood moms about trying really hard to squeeze time for yourself between homework, sporting events and SOLD signs. All-in-all it made me realize that while I needed a break to re-energize, I was doing the very best I could. Though I’d made a mistake in trying to be a super brown mama, I do deserve to do be fulfilled in my life. For me that means a family-first lifestyle. The good news is Northwood Realty is a company who supports and understands this choice. You make your own schedule. Of course, you’ve got to be able to sale homes at the request of buyers, but there are no 9 to 5 hours. Moms are well-suited for this job. We multi-task, we chauffeur, we know how to make a home shine and our time management skills are just stellar. In other words, you’re already doing half of the job. You get help. (It’s not husband help either. You know when you ask him to clean the bathroom and the toilet is still dirty.) It’s REAL help. After you’ve got your real estate license (which Northwood offers classes to help with) as a new agent you are paired up with an experienced, successful agent for mentoring and shadowing opportunities. Plus, Northwood offers classes to help you continue learning even after you’ve passed your real estate exam. At one time I considered a career in real estate until I realized I couldn’t sell water to a whale. But, meeting the moms of Northwood Realty made me realize why so many moms choose this career path. It’s a flexible fit for a family-first lifestyle. As for me, I feel much more re-energized now. I took a little break and have done some re-organizing. I’ve realized that balance is the lifeblood of a mother’s journey. Yes, I need to feel fulfilled in my career, but I also need movie nights with the kids, pedicures and toe rubs to feel like me. So mamas, what changes can you make in your career to feel more like you? Thanks for commenting Lisa and for the encouragement. Yes!!! Great article! You have no idea how excited I was to discover your group! Your Brown Mammas vision speaks to sooooooo many who have spent yearzzzzzzz struggling to find a lifeline to our culture in Pittsburgh and you. You. YOU have helped us to breathe. Any great business has growing pains. It is those pains that ultimately give birth to greatness!!! I can relate to being on E! Trying to wear a ‘do everything ‘ hat as us nurturers tend to do can be overwhelming! I now delegate tasks to each member of our family. I even have our 2 year old picking up her own toys! I make adjustments as needed for our family weekly, sometimes daily. I will let my hubby know when I need a Mommy retreat. That could consist of time with him alone, time with a friend to chat over a coffee or adult beverage or even as simple as his spirit lifting hugso and words of encouragement. I’m no superwoman, but I do the best I can. I have made at least one activity for me (alone) monthly a priority. It allows me to refuel, rejuvenate and be the best Wife and Mommy I can be. We are all reaping the benefits! Thanks for reading and sharing Donnie. Family first and using our skills & talents also! We are not perfect, but we keep on truckin. Thanks for being transparent & sharing your heart! Hopefully more Brown Momas will pursue their real estate license or other independent business so they can have that flexible schedule & still make some money while keeping their families first! Thanks Shyvonne. Love you back. I seriously “LOL” when I read your “not husband help” comment 🙂 So It’s not just my hubby? Awesome post! I can totally relate to being on E! Mom of 6, working full-time, my mother & wifely duties as well as my career goals… This is a lot and I find myself on E at times trying to get it all done. I totally understand, but I’m so glad you didn’t stop or quit because you are awesome, the group is awesome and this community is awesome!